ArtPlace America was looking to develop a professional and engaging website that fit the organization’s vision as well as provide equal billing to its four core lines of work. Moreover, the website needed to be easy to navigate and maintainable by staff on a day-to-day basis. The admin portion of the website needed to be streamlined in an efficient manner. The admin area of the site was difficult and tedious to use, making it very difficult to update content. The search function was difficult to use and did not always produce accurate results. The site needed to serve as a portal for their Grantee Community. We needed to allow Grantees to log in to a members area where they can update their profile information, submit blog posts, post upcoming event information, etc. Worked with ArtPlace to completely redesign and re-imagine their website. Ensured the branding and messaging properly reflected their organization and culture. Engineered the most efficient content workflows possible, allowing their staff to easily update their website. Implemented a robust search for their entire Grantee Database of over 200 organizations utilizing Apache Solr. Constructed a Grantee Portal, allowing Grantee’s the ability to login and manage their accounts. 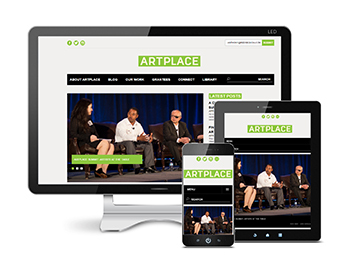 ArtPlace now has a website that accurately reflects their mission and branding, communicates effectively to their constituents, and allows users to quickly and easily find information. ArtPlace staff no longer needs to manually update the website every time a Grantee has a new event to post.